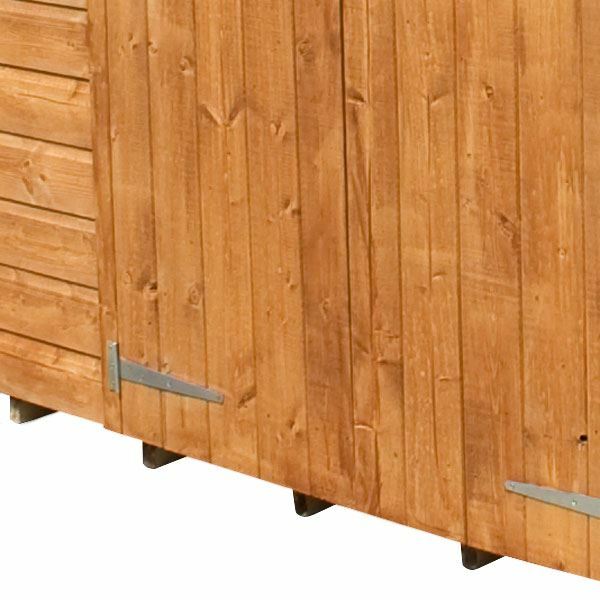 The 8ft x 6ft Waltons Windowless Overlap Apex Wooden Shed delivers great quality and security, making this wooden garden building superb value for money. A double door design makes storing larger garden items more convenient, ideal for storing large pieces of garden equipment such as lawn mowers. A butterfly catch is provided with the double doors to keep them closed. The apex roof adds extra internal head room, meaning taller items can be stored if required. Sanding felt is provided for the roof’s exterior to help defend the shed against adverse weather conditions. This garden building does not feature any windows for extra security, solid wood is harder to break into compared to traditional glass. 8mm thick overlap cladding is placed on top of the 28mm x 28mm frame to create a solid building that will provide many years of hassle free service. 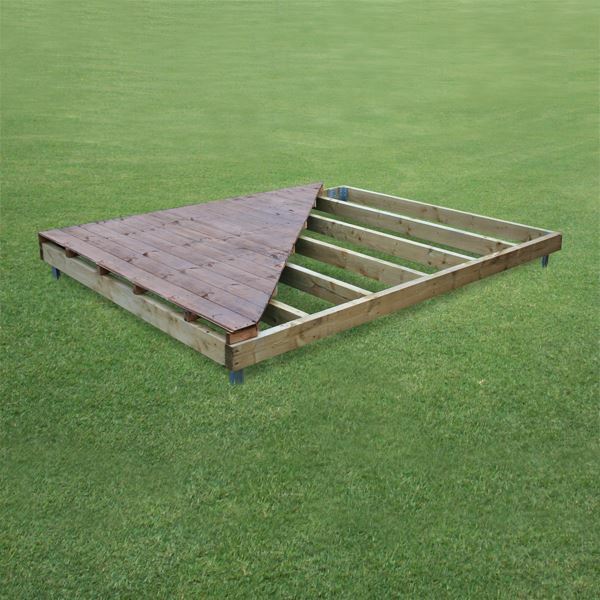 9mm thick solid sheet material create a solid and durable base for the roof and floor, ideal for storage of everyday garden items. This wooden garden shed comes with a 10 year anti-rot guarantee. 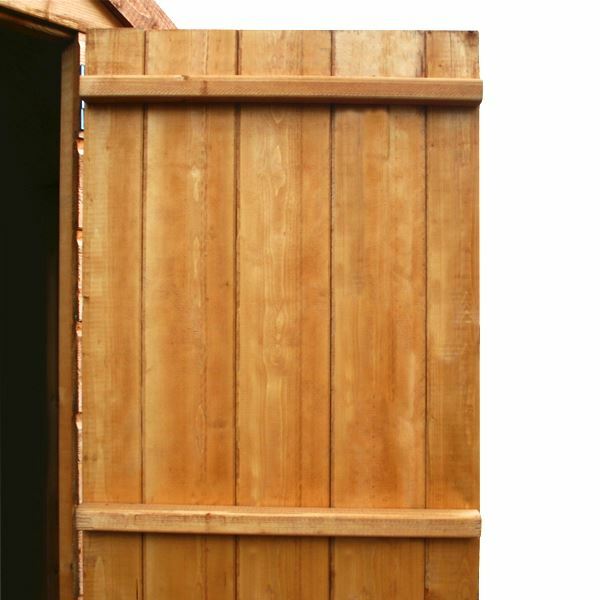 Review:Great value shed easy to put up. Our Reply:Good afternoonThank you for leaving your feedback today. I am glad that you are happy with the building you purchased. 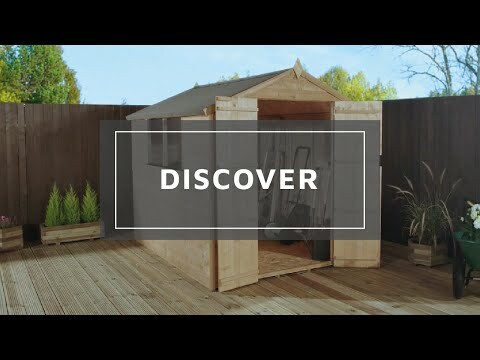 Review:There has been some improvements with this shed as we purchased one five plus years ago. My only concern is some of the porta base wooden struts are bowed, this made it quite difficult to level the base. Additionally the door beading strips were very bowed and unable to use. Our Reply:I am sorry that you have had certain problems. 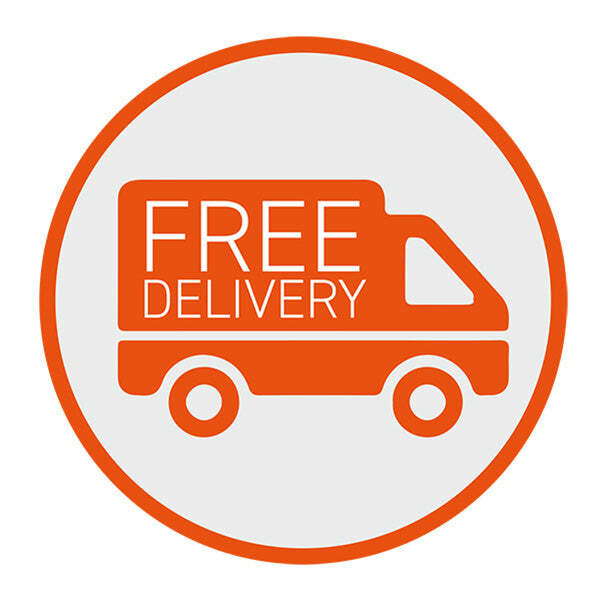 Can I ask you to contact our customer service team on 0800 029 1000? I am sure that they will be able to assist you. Review:Please do not buy one of these sheds. The quality is very poor. I unfortunately I couldn’t rate it lower than one star. Review:Had to fix a few bits that arrived broken. 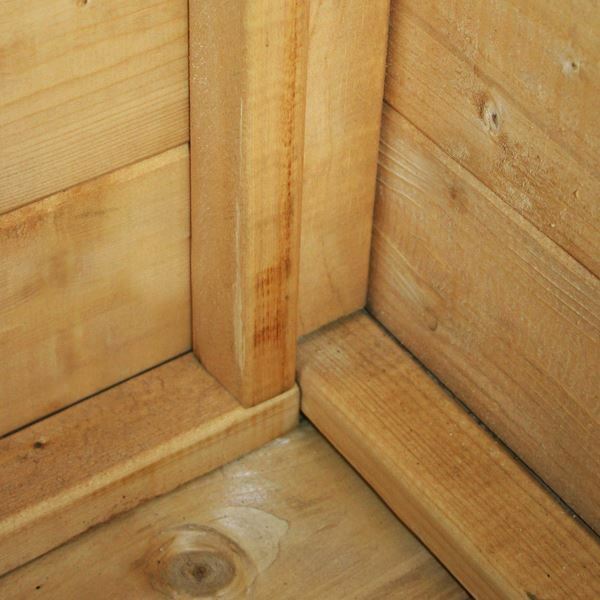 I am so pleased that you found your overlap shed to be of good value for money , easy to assemble and as a result, you would buy from us again in the future. It is always lovely to hear from happy customers and I thank you so much for your great review! Review:Good quality shed but it did take some time to construct! It is great to know that you are happy with the quality of your overlap shed and I am sorry if assembly was not as straight forward as anticipated. Thank you again for your great review. Review:Product exactly as described, only problem was that roof batten split slightly on installation so I had to reinforce. I am glad that you are happy with your overlap shed and should you require any further assistance, please contact us on either 0800 029 1000 or service@waltons.co.uk. It is great that you are happy with your overlap shed and good to know that assembly was straight forward. Thank you again for your great feedback! Review:The product is fine but I'm a little annoyed that it was reduced by £30 after I bought it. As far as I know, it's not due to a sale. Shame. Our Reply:I have checked online and with our sales manager and the item is still priced at the same amount you paid at time of purchase. Review:Good product, easy to follow instructions, all the parts there. Our Reply:It is great to know that you are happy with your overlap shed and the instructions were easy to follow.